The 2018 All Star Game at Nationals Stadium is a once-in-a-lifetime opportunity to bring attention and lasting improvements to the Anacostia waterfront. In September 2004, DC Mayor Anthony Williams announced that Major League Baseball was coming back to the Nation’s Capital after a 33-year hiatus. As part of the deal, the District would build a new, state-of-the-art baseball stadium in a run down southeast Washington industrial neighborhood next to the Anacostia River. But Mayor Williams prevailed, and was right. Just look at restaurants and residences and shops and amenities in the extraordinary Capitol Riverfront area today. Just nine years after the stadium opened, the neighborhood is a great place—the city’s fastest growing and perhaps hottest area. What’s more, the river is already significantly cleaner than it was, and a huge new pollution reduction project will go into operation next year. Cranes still dominate the sky near Nationals Stadium. Today, the Anacostia River, Nationals Park, and the surrounding neighborhoods are in the best kind of symbiotic relationship—all pulling each other up to greater heights. Next July, the Nationals will host the Major League Baseball All Star Game. The Anacostia River and the waterfront should be one of the major themes of the week-long series of events. From the beginning, the story of Nationals Park was tied to the river. Much of the park’s visitor experience is about being on the waterfront. Fans can arrive by boat, or by walking or biking on the Anacostia Riverwalk Trail. On a hot summer day, the best place in the park is on the top level where fans scatch the river breeze while enjoying the game. Inspired by the Anacostia, stadium architects said, “the site of the ballpark dictated the firm’s approach to green design.” Nationals Park was the first professional sports stadium in the world to achieve a LEED Silver rating for environmental design. The more the waterfront improves, the more the game-day experience will be tied to it. Waterfront access adjacent to the stadium. By coincidence, the 2018 All Star Game corresponds with an important event in the District’s history. 2018 is the 100th Anniversary of a visionary federal law that set aside most of the Anacostia waterfront as a resource for the public. The Army Corps of Engineers created most of the Anacostia waterfront in the early 1900s by building a stone bulkhead and filling in the river’s wetlands and marshes, making a hard edge between the water and the land. In August 1918, Congress declared that all the new land would be “Anacostia Park.” This was an idea pushed by the Senate Park Commission, and particularly the great landscape architect Frederick Law Olmsted, Jr., as far back as 1901. The new riverfront public park was, and still is, larger than New York City’s Central Park, San Francisco’s Golden Gate Park, or Chicago’s lakefront parks. Today most of the public parkland is managed by the National Park Service (NPS), and much of it is on the east side of the Anacostia. Anacostia Park features beautiful views, open areas for picnics and trails that connect to other parts of the waterfront (see our waterfront guide for a bigger list of destinations), a wish list of vital improvements, and an energetic new Superintendent committed to the vision of a signature urban waterfront park. The parkland faces its fair share of challenges, though, including aged infrastructure, maintenance backlogs and contaminated areas that need cleanup. The Washington Nationals Baseball Club and Major League Baseball have a grand opportunity to leave a lasting legacy on the Nation’s Capital by highlighting the Anacostia River and its extensive public waterfront parks during the 2018 All Star Game. For starters, some of the many events packaged around the game should be held in Anacostia Park, just across the river, looking back at Nationals Park. All-Star Game events should be held in Anacostia Park, just across the river, looking back at Nationals Park. 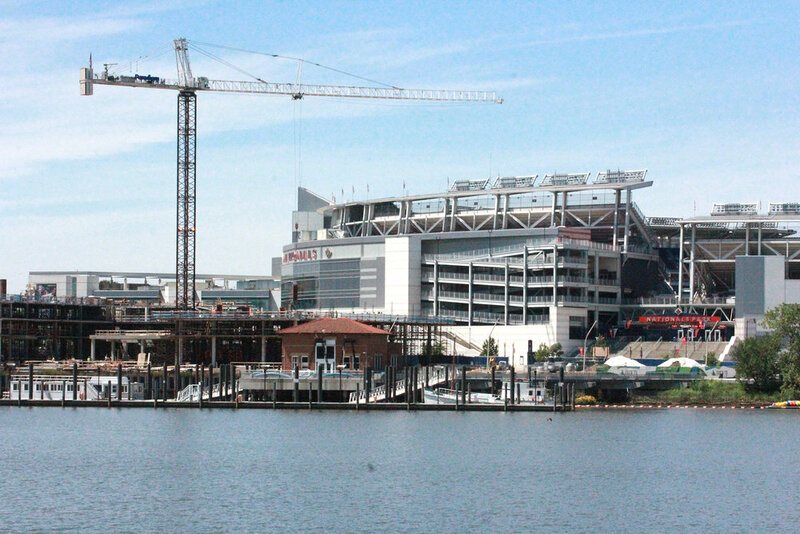 Beyond that, the Nationals and their corporate sponsors could do much more, like commissioning materials to educate fans and the millions of TV viewers about public riverfront at the foot of Capitol Hill and supporting tangible legacy projects to create a second hundred years for the waterfront that far surpasses the first. Utilizing and celebrating the Anacostia River and its extraordinary public waterfront during the All Star Game would also be an appropriate tribute to Mayor Williams and all the other visionaries who worked to bring the nation’s pastime back to the Anacostia.